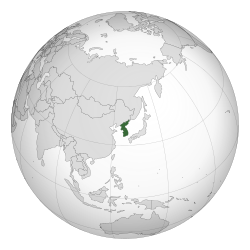 مملكه چوسون (الكورى القديم:朝鮮國) (هانجول:조선국), ده مملكه قديمه اللى عاشت اكتر من 5 قرون, الكواريه العسكريين عملوا انقلاب على چوسون سنه 1897, وكدا خلصت كوريا من حكم چوسون, واللى واخده مكانها امبراطوريه كوريا. ↑ 권태환 신용하 (1977). 조선왕조시대 인구추정에 관한 일시론. ↑ أ ب ت ث 이헌창 (1999). 한국경제통사 52쪽. ↑ Lee,, Seokwoo (2016). The Making of International Law in Korea: From Colony to Asian Power. p. 321. ISBN 978-9004315785. ↑ Kim, Hyunjin (May 21, 2009). Ethnicity and Foreigners in Ancient Greece and China. Bloomsbury Academic. p. 140. ↑ Kang, Jae-eun (2006). The Land of Scholars: Two Thousand Years of Korean Confucianism. Homa & Sekey Books. p. 177. Retrieved August 7, 2015. "Yi Seong-gye issued a royal edict to proclaim the name of the new dynasty to "Joseon" and issued amnesty to all criminals who opposed the transition in dynasty. The statement by Taizu about "only the name of Joseon is beautiful and old" naturally refers to Gija Joseon." الصفحه دى فيها تقاوى مقاله عن كوريا الجنوبيه. و انت ممكن تساعد ويكيپيديا مصرى علشان تكبرها. الصفحه دى اتعدلت اخر مره فى 20 سبتمبر 2018,‏ 18:50.